The most famous event during Monterey Car Week is the Pebble Beach Concours d'Elegance, when the world's rarest rides saunter down a US Open fairway conquered by Nicklaus, Woods, and, most recently, some Irish guy. 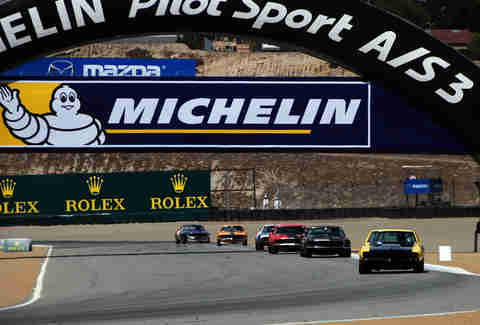 The most exciting action is the Rolex Monterey Motorsports Reunion at Mazda Raceway Laguna Seca, where race cars as old as that official event title is long prove they've got more than a little something left in the tank. 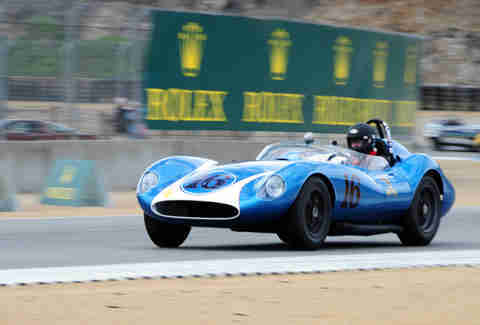 This 1958 Scarab MK1 is worth approximately $2mil, but the exhilarating feeling its driver gets from saying, "Screw it, I'm going to race my $2mil car against 27 other dudes" is priceless. 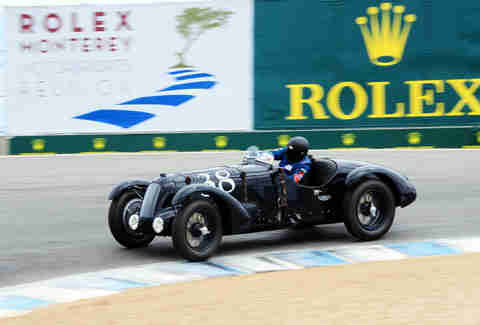 A 1938 Talbot T26SS equipped with a 4500cc engine hit its class's best lap time with a 2:15:403 -- which is funny because they couldn't measure thousandths of a second when this thing was made. 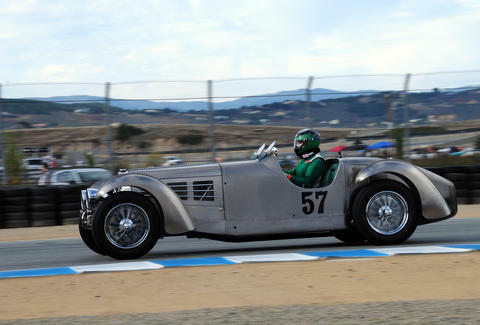 Another Talbot, this one driven by Peter Mullin, a financial services entrepreneur who's done well enough for himself to not only own this car, but also found a museum North of LA dedicated to other rides of its caliber. 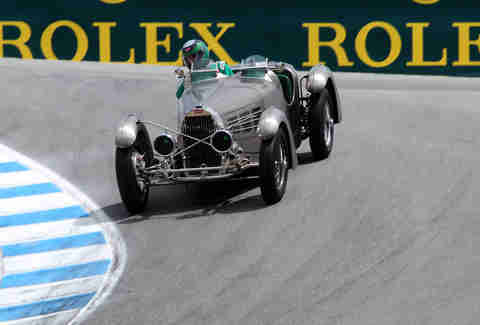 Jim Hull's one-of-a-kind, magnesium-bodied 1935 Bugatti Type 57S navigates the famed Corkscrew during the 1927-1951 challenge, when guys driving 1927 cars were like, "Really? 1951?" 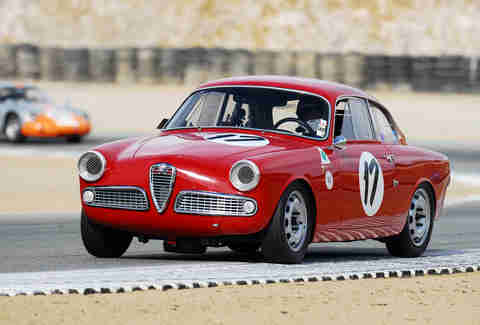 A 1956 Alfa Romeo Sprint Veloce exits Turn 3 on the way to finishing 3rd, right behind a 5358cc Corvette and a 2953cc Ferrari. The driver of this 1936 Delahaye 135 kept looking back to see who was behind him. 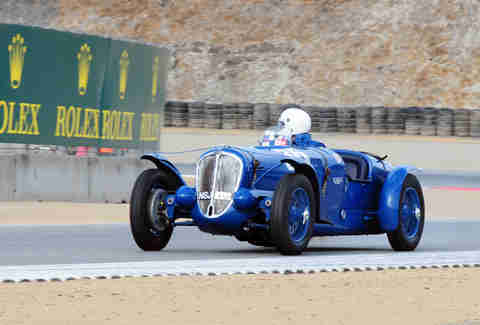 Chances are it wasn't another 1936 Delahaye 135. 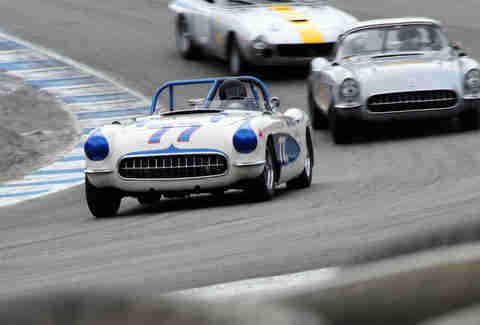 Grouped in with "1955-1962 GT cars", this '57 Corvette is... well, it's just awesome. 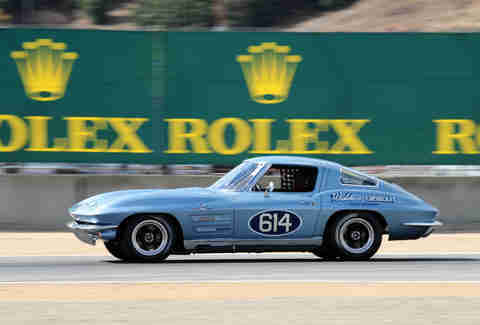 But not as awesome as this 1962 Corvette, which ended up winning the 20min race by 9.5sec. 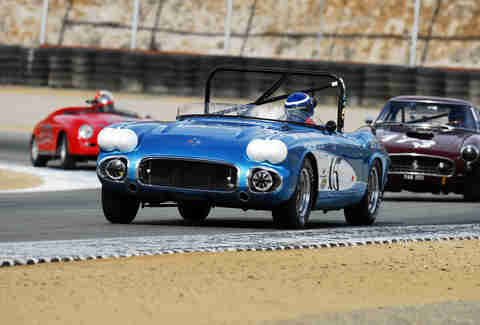 More '57 'vettes. 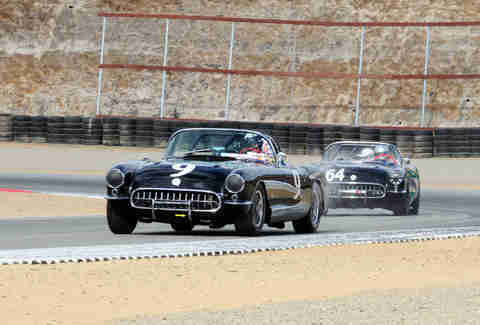 Here, #64 starts to overtake #9 as the latter experiences some engine troubles. 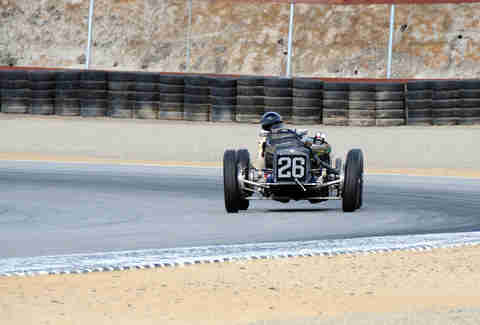 #64 finished 11th out of 38, while #9... was finished shortly after this lap. 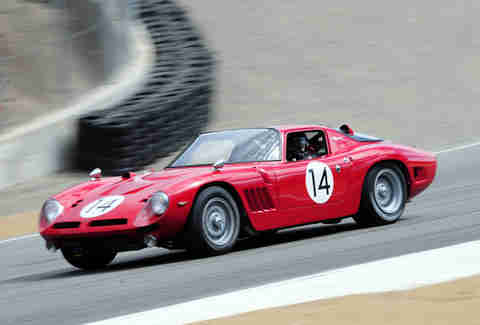 A 1968 Bizzarrini 5300 GT Strada exits the Corkscrew to charge down towards Turn 9. Only 67 5300 GT Stradas were ever made, partly because their rarity made them even more alluring, and partly to freak out OCD enthusiasts who desperately needed them to produce a nice round 70. Please make three more. Please? 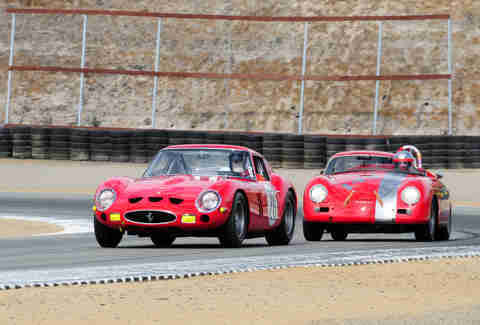 Red cars briefly ruled Turn 4 as this 1963 Ferrari 250 GTO Berlinetta stayed in front of a Porsche 356A Convertible D.
Vic Edelbrock, Jr.'s Chevy is one of the only models to sport a split rear window. 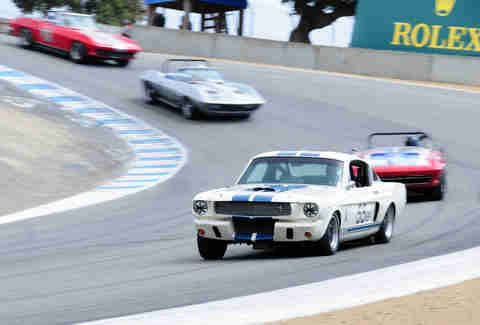 Vic Jr.'s been one of the biggest players in the automotive after-part industry ever since he took over Edelbrock from his dad, but today he got trounced by his daughter Christi's 1966 Shelby GT 350. Some family rivalries are cooler than others. Mustangs and a Camaro or two. There's actually a song called "Johnny's Camaro" by North Carolina folkster David Wilcox that makes fun of a guy for valuing his car over his girlfriend, but if Johnny's Camaro is anything like these Camaros, you can kind of see his point. 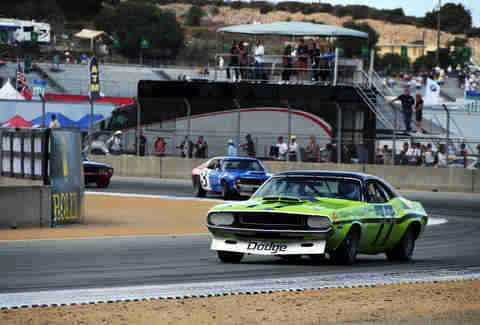 This 1970 Dodge Challenger placed 10th in the Group 8A "1966-1972 Historic Trans-Am" morning race. The race was won by an AMC Javelin, but not the one in the background, which only ended up completing one lap, thus traveling not much farther than you could throw an actual javelin. 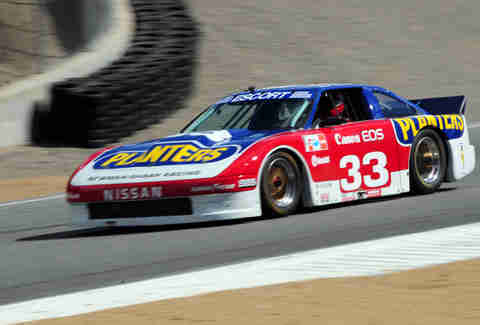 This car might need an introduction (it's a 1988 Nissan 300ZX), but its driver doesn't: that's Adam Carolla behind the wheel, changing things up from the Datsun 510 he raced back in March. Carolla also got together with Dr. Drew for a live Loveline performance, but again, when your ride's as affection-worthy as any of these, who cares if you can sustain a successful relationship with a human.